On April 2, 1792, George Washington signed into law what’s commonly referred to as the Mint and Coinage Act. It was one of the first major pieces of legislation in the young country’s history… and it was an important one, because it formally created the United States dollar. Under the Act, the US dollar was defined as a particular amount of copper, silver, or gold. It wasn’t just a piece of paper. A $10 “eagle” coin, for example, was 16.04 grams of pure gold, whereas a 1 cent coin was 17.1 grams of copper. The ratios between gold, silver, and copper were all fixed back then. But if we apply today’s gold price of $1292 per troy ounce, we can see that the current value of the original dollar as defined by the Mint and Coinage Act of 1792 is roughly $66.75. 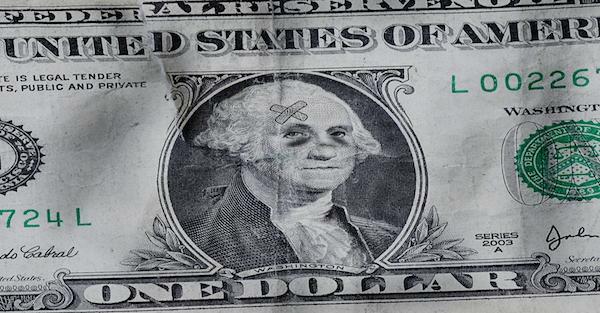 In other words, the dollar has lost 98.5% of its value since 1792. What’s incredible about this constant, steady destruction of the currency is how subtle it is. Few people seem to notice, because modern day central bankers try to “manage” inflation between 2% to 3% per year. 2% to 3% per year is pretty trivial. But it happens again the next year. And the year after that. And the year after that. After a decade or so, it really starts to add up. But there’s an important, other side of the equation: income. Costs are clearly rising. And it’s fair to say that incomes have been rising too. But which one has risen more? In 1982, back when I was a toddler, the price of a Ford Mustang was $6,572. Today the cheapest Mustang starts at $25,680 according to Ford’s website. So a Mustang today is around 4x as expensive as it was 36 years ago. US Labor Department data from 1982 shows that average earnings were $309 per week, or $16,086 per year. That was enough to buy 2.45 Mustangs. Today’s earnings are $881 per week, or $45,812 per year. That’s only enough to buy 1.78 Mustangs. So when denominated in Ford Mustangs, people’s incomes have fallen 27.3% since 1982. More recently than that, say, back in 2005, an entry level Mustang cost $19,215 at a time when average wages were $40,664 per year– or 2.12 Mustangs per year. So even since 2005, average income levels have fallen 16%. Obviously this trend doesn’t just apply to Ford Mustangs. If we look at housing in the United States, we can see that the median home price in 2003 was $186,000 (according to Federal Reserve data) at a time when the Labor Department reported average weekly wages of $620. So that was roughly 0.173 houses per person per year. Today the median home price is $328,000, with average wages of $881, or 0.139 houses per person per year. That’s a decline in income of 19.6% over the last 15 years. Again, it’s a slow, subtle destruction. But over time, inflation REALLY adds up. Over the long-term, the average person becomes poorer. We can view this trend anecdotally as well. Back in the 1950s and 1960s, it was common for a man to go out into the work force and support his entire family. On a single salary, the average American family could afford a home, a car, modern technology at the time, savings, and even a summer vacation. Today it’s normal for both spouses in a family to have full-time jobs, just to make ends meet. Data from Pew Research shows that 70% of American households (married couples with children) back in 1960 were single income, i.e. only the father worked. Today, 60% of households have BOTH spouses working. And given the other statistics we routinely see about how the average US household has very little savings and is loaded down with debt, they’re barely making it even with TWO incomes. That’s because inflation has slowly robbed people’s livelihoods. What’s truly bizarre is that this exact same inflation is actually OFFICIAL POLICY. Both central bankers and politicians deliberately try to engineer inflation, and they formally disclose this to the public. The Fed announces its “inflation targets”, and economists panic if inflation is too low… or even worse, if there’s “deflation” and prices fall. The government actually has a vested interest in inflation. They like rising prices because the national debt is so obscenely large. The idea is that, if the government borrows $10 billion today on a 30-year term, they want the value of that $10 billion to be as little as possible three decades from now. So a slow, steady destruction of the currency is actually to their benefit; the government wants to be able to inflate the debt away. But as consumers, we prefer falling (or at least stable) prices. Price stability ensures that people’s purchasing power remains the same. Rising prices are destructive, rewarding those who go into debt (like the government) at the expense of anyone who has been responsibly saving. Think about it– if you put $100 in a savings account 10 years ago, you wouldn’t be able to buy as much with it today as you could have back then. Saving money actually COSTS you purchasing power. The month-to-month and year-to-year variations on inflation will be all over the board. But the long-term trend is pretty clear: prices continue to rise. And it’s fair to say that no nation or empire in history has ever been able to prosper by slowly destroying the value of its currency.